It’s been two years since I started work on Chordious 2.0, and today is the first official release. Read more about it in the announcement blog post. Just a quick message, I’ve been feverishly working on the next version of Chordious, and today have just announced the first “preview” build of Chordious 2 for Windows. It’s not 100% complete, but I think there’s enough there to start gathering feedback. Find out more in the kick-off blog post: Try out the Chordious 2 Preview for Windows. Chordious 1.0.0 now available at chordious.com! It’s here! Over a year since my first code check-in, and I’m finally ready to release Chordious 1.0.0 into the world. 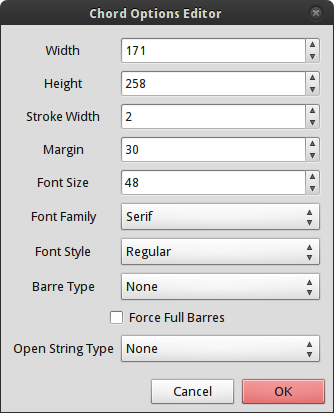 Need chord charts for your favorite stringed instruments? Want to make your own? 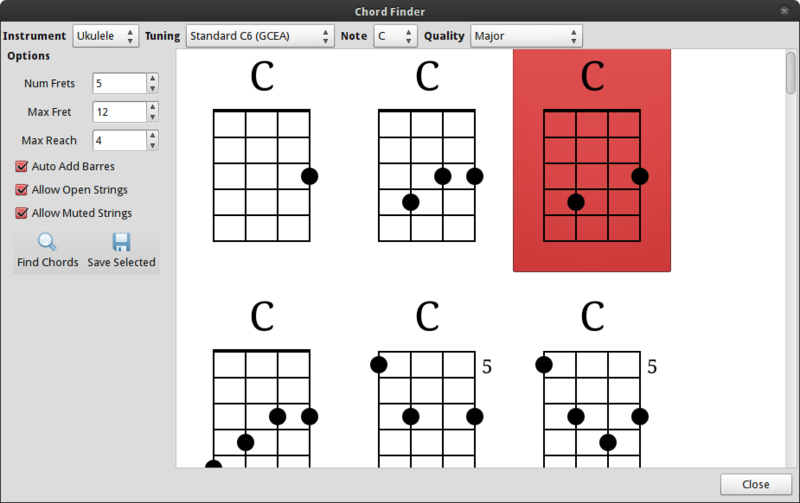 Chordious helps you find chords and make customized chord diagrams for free. It’s my first major cross-platform application, and is available now for Windows, Mac OS X, and Linux, with fancy-pants installers to boot. Find out more at the new official Chordious website. For download links, check out my Chordious page, or the Chordious project page at Launchpad. You’ll find links for both the binaries and the source. Be sure to download the right binaries for your system (Windows or Linux / Mac OS X), and follow the installation instructions carefully. 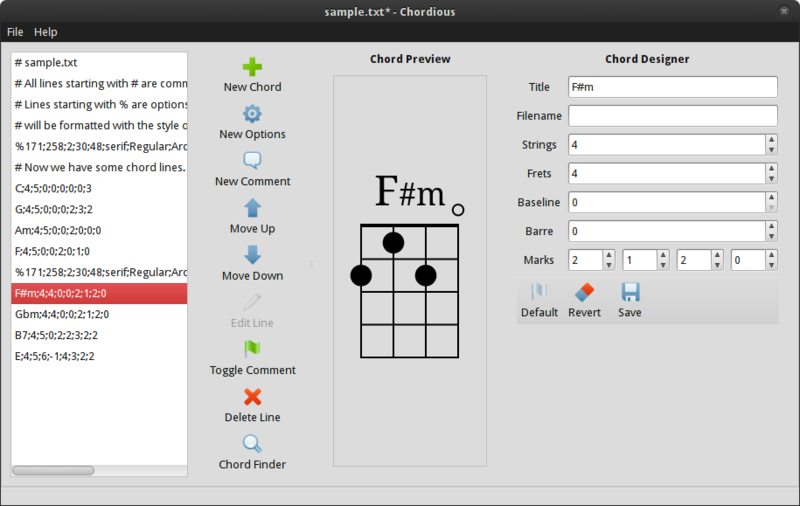 Note: Chordious is still beta software, so please be sure to backup any ChordDocuments and diagrams you create. If you run into issues, or have feature requests, let me know! 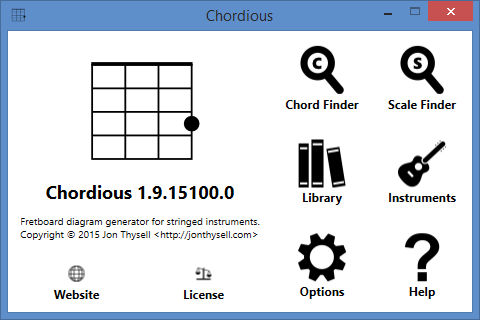 Chordious 0.6.0 available, now with an integrated chord finder! 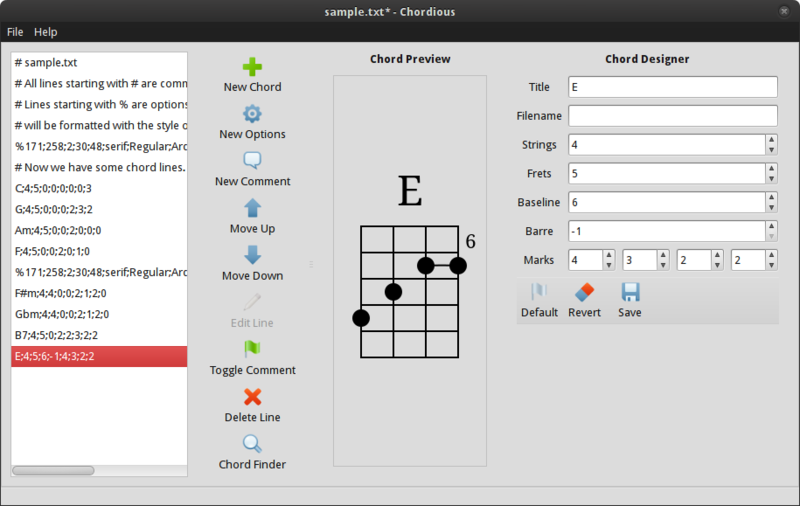 It’s been five months since I last released Chordious, my free app to generate beautiful chord diagrams for stringed instruments. Version 0.4.0 brought the first public iteration of the graphical chord designer, greatly simplifying your ability to create diagrams to meet your own style needs. The problem was, you still needed to know what chords you wanted to make diagrams for. The biggest ask then was for an integrated chord finder. 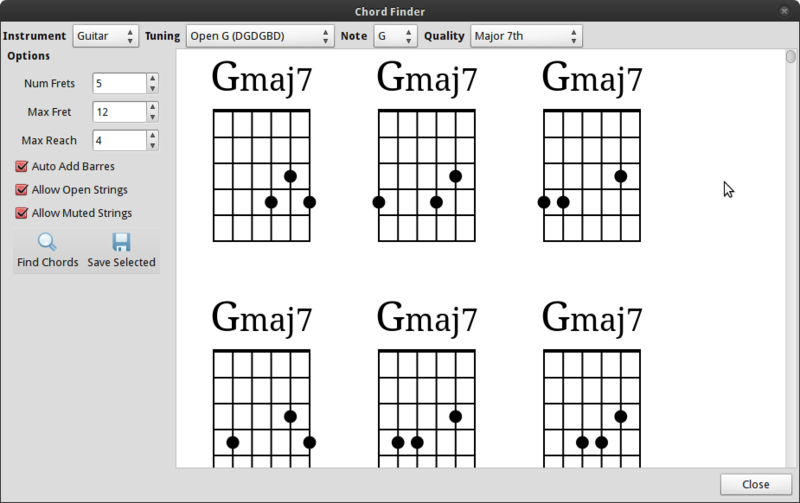 It took me some time to bone-up on music theory, and then figure out exactly how to implement a chord finder in an efficient way. Other apps have done it before, but it’s a non-trivial problem to solve, and so I wanted as efficient, complete, and flexible solution as possible. 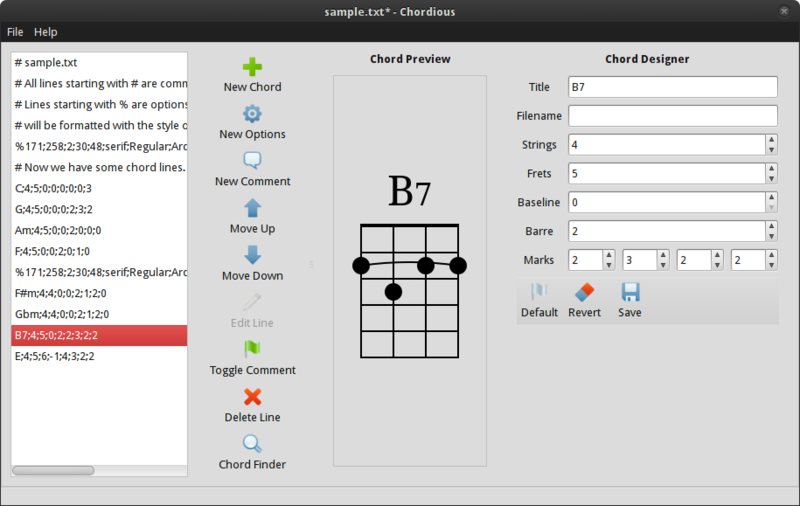 Now you can simply pick your instrument, tuning and search parameters and then search for chords! Right now you’re limited to the instruments, tunings, and chord types that I’ve entered- to start I just added some of the more popular banjo, guitar, and ukulele tunings. In the future I plan on making the list user editable. Same thing with the chord qualities- right now you’re limited to major, minor, augmented, diminished, 7th, 6th, and some of their variants. 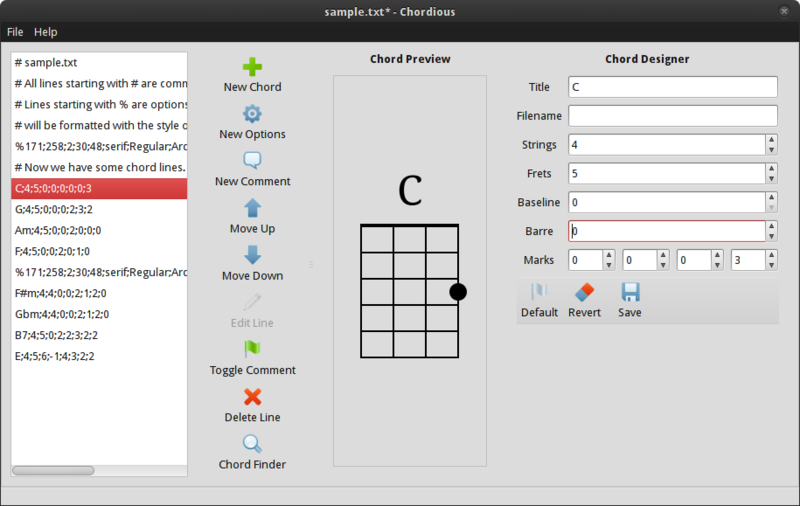 Note: Chordious is still beta software, so please be sure to backup any ChordDocuments and diagrams you create. If you run into issues, let me know! I’ve still got plenty of room on the road-map to version 1.0. Update (02/16/2014): I finally fixed the StartChordious.cmd script to work on Windows XP, so I’ve updated the 0.6.0 windows binaries zip to include the fix.